The Bay Area fosters a culture of forward thinkers and new ways to solve problems in our world, including in our food system. Ripple Foods is one such startup in Silicon Valley hoping to disrupt the dairy industry with pea protein. The company joins a growing list of game-changing food startups that have launched out of the lab and into the consumer market in just the last few years. Memphis Meats uses animal cells to make lab-grown beef, Impossible Foods makes a plant-based burger and Clara Foods uses yeast to produce egg whites without the chicken. We’re told milk does a body good, but the dairy industry can be a dirty business, polluting our environment and pumping large amounts of methane into the air — the biggest contributor to global warming. And Ripple founders wanted to do something about it, so they turned to the humble pea. 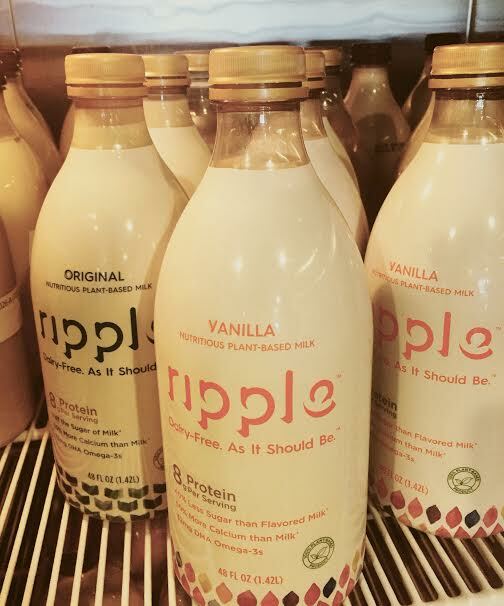 Ripple’s first dairy-free milk products made from pea protein. Sure, there are already alternatives to dairy milk, but many of them are problematic — soy is mostly from GMO crops and full of pesticides, almond milk takes up a lot of precious water resources and coconut milk is hard on those suffering from irritable bowel syndrome. But peas are plentiful, full of vitamins (an extremely good source of vitamin K, manganese, dietary fiber, vitamin B1, copper, vitamin C, phosphorus and folate, among a long list of other nutrients) and GMO-free. And Ripple believes it has created the superior non-dairy option and perfected that same milky “mouth feel” you get from dairy using the plant’s protein, sans that pea soup taste. Ripple also claims to be vegan-friendly, lactose, nut, and gluten-free, doesn’t use GMO products and uses 96 percent less water than dairy, nut and soy milk. The startup has raised $13.6 million from investors and started selling its first four non-dairy milk flavors — original, original unsweetened, vanilla and chocolate — in Whole Foods nationwide in April. Both co-founders Neil Renninger and Adam Lowry ran successful companies previous to founding Ripple. Lowry co-founded Method Soap and Renninger helped to grow the successful renewable chemicals company Amyris, which IPO’d in 2012. I went to speak with Renninger and Lowry at their Emeryville lab and try their first milk replacement product for myself. Check out the video above to watch me drink pea milk and learn more about this tasty startup.